The BBC's weekly The Boss series profiles different business leaders from around the world. 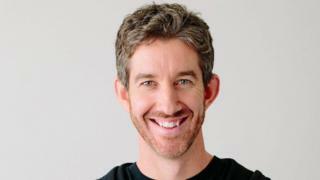 This week we speak to Scott Farquhar, co-founder and co-chief executive of software company Atlassian. Scott Farquhar remembers his life-changing "sliding doors" moment. The Australian entrepreneur was on track to join one of the country's top military institutions after he finished high school. But the letter from the Australian Defence Force Academy offering him a place got lost in the post. By the time it arrived at Scott's family home some two months late, he had opted to go to university instead. That missing letter set him, and business partner Mike Cannon-Brookes, on a path to become Australia's first tech billionaires. "If the letter had turned up earlier, history may be slightly different," says Scott, now 39. With a credit card and not much else, the pair founded business software company Atlassian in 2002. The Nasdaq-listed firm is now valued at $25bn (£18.8bn) and the two men are worth an estimated $7bn each. Growing up in a working-class suburb of Sydney, Scott says he always had an interest in computers. "I remember crying myself to sleep one night because my friend had a computer and I wanted one too," he says. His parents ended up buying him a second-hand machine and he spent about a year trying to make it work. Computer programming came later. Scott met Mike while both were doing a degree in computers and business at the University of New South Wales in Sydney. The two friends finished the course and wanted to work for themselves. Their goals were simple: don't wear suits, and earn more than 48,500 Australian dollars ($35,000; £26,000) a year. That was roughly the salary other graduates had been offered by big banks and accounting firms. "At that stage I was living in a shared house at university and eating ramen noodles every day," says Scott. "We didn't have much to lose." A brief spell as a "terrible" tech support company was followed by a shift to business software. Orders were hard won at first, coming mainly from people they knew. Then one day in 2003, a fax arrived. It was a purchase order from American Airlines. That fax still hangs outside Scott's office at the company's headquarters in Sydney. It was the end of what he describes as "hand-to-hand combat" to find customers. Now they were coming straight to Atlassian. "That was the turning point when we knew we'd make it," he says. Scott credits the company's growth in part to its sales model. By making its products available online, he says they took business software sales off the golf course and direct to customers. It meant that Atlassian, which last year topped $1bn in revenues, could access markets it couldn't afford to reach with a traditional sales force. Nowadays Coca-Cola, Twitter and Visa are among the thousands of firms using it products. As the business grew, it secured $60m of external investment in 2010. Atlassian, named after the Greek god Atlas, floated on the Nasdaq stock exchange in New York in 2015. Scott was there in person to ring the bell with Mike and other colleagues, when the surprise arrival of his wife and three kids left him "wiping back the tears". They all then celebrated in Times Square with greasy pizza and cheap champagne. "We hadn't thought about the celebration part of it," he says. It's a success story that seems relatively unblemished. A vague idea, pursued with little capital, that blew up into one of Australia's most prized tech exports. But Scott is adamant the ride hasn't always been smooth. "It has taken 17 and a half years," he says, stressing the firm isn't an "overnight success". "We've made mistakes along the way. We've launched products too late, recently we had to shut down a product that didn't make it in the market." But there is no doubting Scott's commitment to the business. While on his honeymoon in Africa he flew back to Sydney to deal with a problem at work. "It did take me quite a few years to make it up to my wife," he says. Technology analyst Ray Wang of Constellation Research says that Scott and Mike's close friendship is a key factor behind Atlassian's success. "People often look at Atlassian and say... this story is so good. It is because they have been friends for so long. They are stable, normal people. "They're pragmatic, they know they got lucky." Scott says that he and Mike - who is also 39 and also has the co-chief executive job title - "complement" each other. As well as running the 3,000-employee company together, they are also neighbours in Australia's two most expensive homes. A hole in the fence between their Sydney harbourside mansions - Scott's cost more than A$70m - lets their kids crawl through to play together. Looking to the future, Mr Wang says that the pair's biggest battle will be fighting off unwanted advances. "If someone made an offer for them at $50bn would they hold?" he says, pointing to Microsoft, Oracle and IBM as possible suitors. Scott says his biggest challenge in the future is securing more employees with the skills that the company needs. To help do this he is working with the Australian government on how to best bring in more talent from overseas. He also wants to build a new technology precinct in Sydney, a hub he hopes will act as "the lighthouse" to attract people to Australia.